To support our pupils in developing their reading skills, Elemore Hall has recently introduced the Accelerated Reader Scheme. 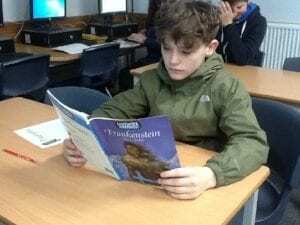 Accelerated Reader is a reading programme that inspires pupils to read at their own level through a system of assessment and selection of appropriate books – both fiction and non-fiction. After reading a book, pupils complete a quiz on the computer to test their understanding. Once the quiz is completed, the computer will give immediate, constructive feedback which can then be used for positive intervention, particularly with those pupils who struggle with their reading. There are rewards and privileges linked to the system to ensure motivation and the pupil is awarded points and certificates for achieving various milestones. The level of success achieved when entering the questions helps to identify the next book range that the pupil should choose from. You can access how well your child is progressing by visiting HomeConnect. We also like parents and carers to encourage their child to read at home. It is great that they are reading books, but there are also many more everyday things to read in the home such as the newspaper, TV guide and ingredients. If you would like any help supporting your child reading at home please contact Mrs. Groark (Literacy Support) or your child’s Personal tutor at the school.